You should always pay attention to security and lock your doors. But sometimes quick, easy access is needed in case of an emergency. This is especially true for seniors. If they live alone and have a medical emergency, every second counts. The medical team needs to be able to get in quickly without breaking windows or kicking down doors. Gaining access quickly matters. Also, if someone comes to check on you or help you they need to get in quickly too. This is why key safe boxes serve a great purpose. These strong metal boxes can safely store keys to your home. Most of them are suitable for outside use and are nearly impossible to crack. You get a great sense of security because it’s way better than hiding the key under the doormat or flower pot. Seniors and their caregivers can get real peace of mind that someone can get in if the elderly person needs help. I want to discuss key safe lock box options available, and also the features they have so you know what to look for. Different types are made, some are easier to use, and some pride themselves in being extremely tough. Some key lock boxes you can hang on your front door, other can be wall mounted in a secure location. So, what are best key safes for elderly? If you know you need a lock box or key safe, here are my top picks. But, if you’d like to learn more about them or want to read more detailed reviews, keep on scrolling! Images, Ratings, & Prices from Amazon Product Advertising API - Updated on 2019-04-22 at 15:26 - contains affiliate links (see footer). A key safe from a renowned manufacturer, this lock box is great for every type of use, indoor and outdoor. It has a large internal space in which you can store multiple keys and even access cards. I also like that it is portable and easily moved and installed because of the removable shackle. It uses a 4 digit combination that is easy to set and reset. The dials light up automatically so they are great to use in low light conditions. Also, the size is quite good. This key safe fits a door knob easily, and it comes equipped with a special weather cover to prevent freezing and jamming. Users who tried this product are very satisfied. It’s great value for money. The lock box is very sturdy and durable. Also changing the code is straightforward, without difficulties. 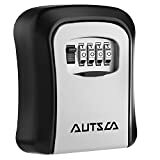 Learn more about this key safe on Amazon. This fantastic product by Kingsley is one of the best key safes for elderly folks, and has more storage inside than most other key safes. It can easily fit 5 keys inside the casing. It is very durable, constructed from metal only. The locking mechanism uses a 4 digit code which gives you 10,000 options to choose from. Besides this, it is very sleek looking with a black body that camouflages well from potential burglars. Besides the full metal construction, it has a weather resistant fortification making it great for all types of conditions and absolutely safe to keep outside. Another upside is that it has a side opening door. Unlike many others that have a lid that is taken off, this design makes sure you won’t lose anything since the door stays attached. 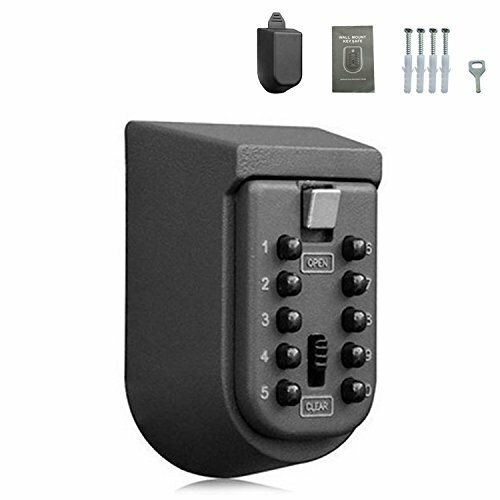 Many people who have bought this key safe lock box are impressed. It’s bigger andmore secure than it looks. The build is very high quality and it gives you the sense that your keys are very safe. The code is also very easy to set up. 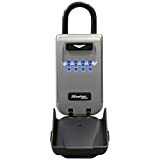 Check today's price on the Kingsley lock box at Amazon. This product is a little different from the previous ones. It is meant to be mounted on a flat surface, and the manufacturer provides you with the mounting hardware to do that. The lock design of this one is also different. It uses an alphabetic dial which is probably safer than the punch in options. You set up and then use a 3 letter combination, and you must do it in a specific order for it to open. The body uses innovative StrongBox design which is unmatched when it comes to quality and security. For this reason, it is probably the best outdoor key safe. If you choose to buy this product, you will certainly become one of many satisfied customers. They say that the lock box is amazingly tough, easily mounted, and the storage space inside is big enough for several keys. Once you get used to it, the alphabetic dial gives you increased security. 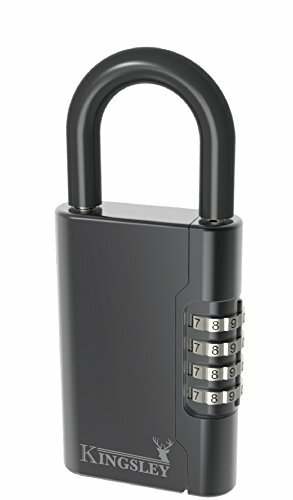 Click here to learn more about this unique lockbox at Amazon. This great product by Autsca is the second wall mounted option on this list. It is made from high strength krisite which makes the box resistant to everything – including hammer, drill, saw and similar tools. You can be absolutely certain that your key isn’t going anywhere. It’s also weather resistant. 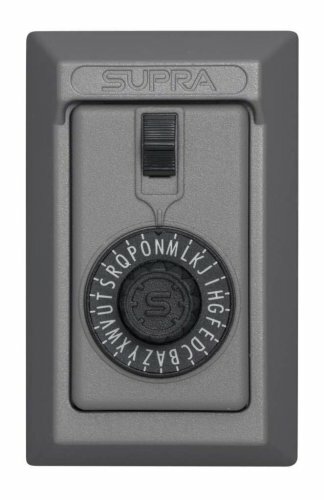 This key lock box uses 4-digit combination dials, which are set to 0000 in the beginning. You get a manual to learn how to reset the code whenever you want. Many people tried this product and were so happy with it they went out and bought more for their other properties. It’s extremely easy to use, everything works smoothly. The instruction book is great and easy to understand. Learn more about this wall mounted key safe by clicking here. Finally, we have a classic product that is very simple to use. It is also mounted to a wall and has a 10 push button which can be programmed to a 4-digit combination. It’s very easy to install anywhere, with screw kit and mounting hardware eliminating the need for a power source. It can fit up to 3 keys inside. The whole product is made from zinc and aluminum alloy. The lid has a plastic cover on the inside which is very easily removed and the code is set and reset simply by using a regular screwdriver. Users have said that this is possibly the easiest key lock box to use. It’s mounted very quickly, the combination set in a blink of an eye, and it has enough space to fit a few of your spare keys. It does just what it promises. Just be careful to change the code every now and then to prevent wearing the numbers down. 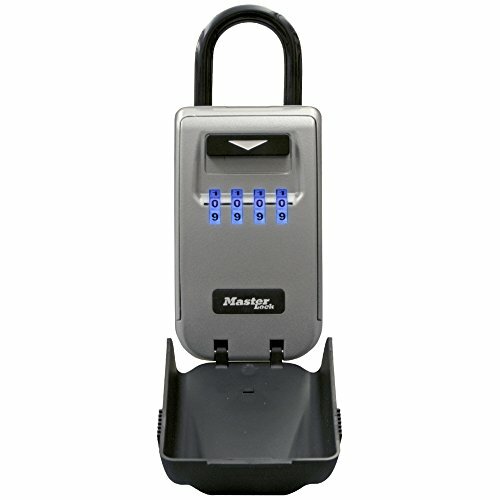 Click here to learn more about this easy to use lock box. There are certain features you need to consider when choosing the best outdoor key safe. Depending on your situation, different products may best fit your needs. So, what should a key safe be like? You need a product that serves its purpose, and can’t be broken into easily. There’s no point in having a key safe lock box which a thief can easily crack. All the products I reviewed are very secure. It’s good if a key lock box blends in. You don’t want one that screams that it has a key to your home inside. Also, it should be easy to mount and hide in any place you find suitable. The product you choose has to have enough room inside. There are different options available which can hold from one to more than five keys. But larger space inside equals a larger lock box and then it becomes more difficult to hide it. The lock type has to be simple for you and other people who are going to use it. It’s bad if it takes a lot of time just to open the lock box and get the key. Most of these products are very sturdy, made from steel. You want it to be able to withstand all types of weather – hot, cold, rain and even snow. This is also important for many. You need a reliable product which will keep your keys safe, but won’t go too hard on your budget. I had this in mind too when I chose the products to review. How Does a Lockbox Work? A key safe lock box is very simple to use. It’s a sturdy metal vault with room inside to place your key (or several of them is you buy a bigger box). The lid is then closed and the vault locks. When you want to access your key again you enter the code and the lid opens. Best key safes for elderly have codes that are easily set and reset. When you buy your key safe, the manufacturer gives you a user manual explaining how to set your code for the first time, how and when to change it, and how to lock the box securely after placing a key inside. As featured in the reviews above, key safes can have push down buttons, combination keys, or a spin dial for example. Are Key Safes Really Safe? Yes, they are indeed very safe. The steel used to make a lock box is very tough. There are two ways of opening the box – entering the code or breaking it. And it’s very hard to break it, it makes a lot of noise and consumes a lot of time. It’s a lot easier for a thief to break a window or knock down your door. You have nothing to worry about. However, you should be careful when setting the code and locking the box after use. A common problem with some key safe boxes is that people forget to shuffle the numbers after placing the key back inside. This only returns the lid back into its place without locking the box, so be careful not to do this. Are Key Safes a Good Idea for Seniors? Some seniors greatly value their independence and like to live alone. But even the toughest people sometimes need help. If a family member is not near, and a neighbor that keeps a spare key isn’t home, what then? This is why key safes are a great idea for seniors. Key safes offer a piece of mind by keeping a spare key outside your home. If you get locked out by accident, you don’t have to call a locksmith. Also, the combination for opening the key safe can be shared with anyone that needs it. The code can be easily changed anytime so you always have control who has access to the house. It is a good idea not to leave your lockbox in plain sight. Unless you are using one that you hang on your door knob, but even then it’s not a bad idea to hang it on your back door. If you have a key safe which is supposed to be mounted, always do that. Never leave it unfitted, hanging in a bush or behind a flower pot. You don’t want anyone to be able to steal it. When deciding where to mount your key safe lock box you should consider a few things. It doesn’t need to be apparent that a vulnerable elderly person lives there. Your lockbox shouldn’t be seen from the road. It’s also not a good idea if it’s at eye level, or sits right beside the door. This makes it pretty obvious for potential burglars. On the other hand, when you choose a hiding place, it needs to be quickly accessible. You should always mount it to a hard surface, and you should place it beside a window box, drainpipe or someplace similar to make it less obvious. This way you get increased safety but also provide quick access to anyone that needs it. Who Should Know Where Your Key Safe is Hidden and the Code? You should share the location and code of your key safe lock box only with people you trust. These are the people who will be there for you when you need it – if you fall down, have an accident or feel ill. This includes family members, neighbors that you trust, or medical services. They should be able to quickly access your home anytime when you call. And if by any chance the code falls into the wrong hands, it can be changed easily. Key safes are amazing products that make it easy for elderly to get help when they need it most. They eliminate the need of making copies of the key. 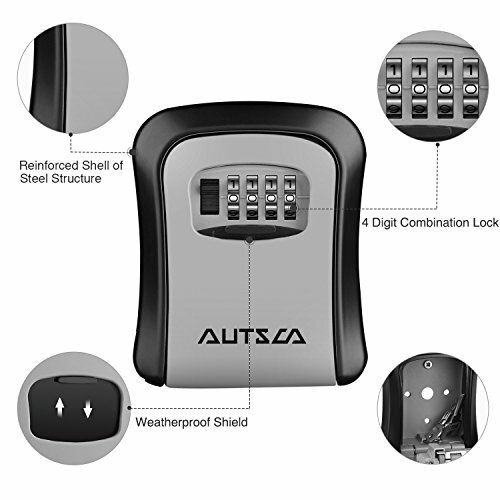 Considering the specific needs the elderly have, I would say that the AUTSCA Key Lock Box is most suitable. It’s very easy to operate, with enough space inside. It’s also very easy to mount wherever you want and the build quality is amazing. But be certain you won’t be making a mistake if you choose any other of the best key safe lock boxes featured on this list. Do you have any tips to share about getting access to seniors during emergencies? Have you used any key safes or lockboxes? Please feel free to share your tips and advice in the comments below!